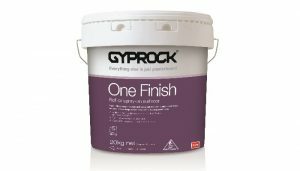 CSR Gyprock has launched One Finish, a pre-mixed acrylic compound for uniform surfacing on plasterboard walls and ceilings, subject to critical lighting conditions. One Finish’s composition assists in efficiently achieving the highest criteria of a Level 5 finish with easy application. This formulated surfacer hides imperfections by concealing variances in texture, porosity and sheen between paper and compound. As a drying product, it is ideal for skim coating with the ability to fill flaws while smoothing irregularities. Its paint-like consistency leaves walls and ceilings with a premium white finish and flawless appearance.